During the pre-application consultations GreenPower held with the local communities regarding the development of Carraig Gheal Wind Farm, GreenPower agreed to put in place a community benefit fund that would be available to the communities surrounding the wind farm. GreenPower makes contributions to the fund twice yearly in April and October totalling £46,000 per annum. 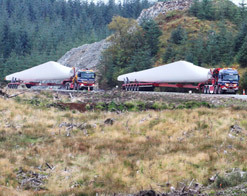 The Carraig Gheal Wind Farm Community Benefit fund is divided between two funding schemes; a micro grant scheme with awards of grants up to £500* available to individuals, constituted and non-constituted groups and the main grant scheme with awards of up to £7,000 available to constituted groups only. * Please note that the £500 limit for micro-grants is a temporary increase from £250 for the 2019/20 year and it should not be assumed this limit of £500 will be available in the future. The two grant schemes are administered and managed by GreenPower. All grant application enquiries should be directed to Jennie Cowley at jennifer@greenpowerinternational.com. Jennie issues all application forms, receives all completed applications and is there to provide any guidance on the application process as necessary. The Carraig Gheal Wind Farm Community Benefit Fund Steering Group meets at least twice a year to decide which of the main grant applications will be funded. The group is made up from members of the five community council areas bordering the wind farm. These community council areas are Avich & Kilchrenan, Taynuilt, Glenorchy & Innishail, Kilinver & Kilmelford and Kilmore. The current round of funding has now closed; the next round of funding will open on 1st May 2019 with a closing date of 31st July 2019. What difference is the fund making to local communities?